Magnesium Citrate - 400 mg, 75 softgels (Nature's Wonderland) - Penn Herb Co. Ltd.
Magnesium is an important mineral that is critical for energy production, muscle contraction, cardiovascular health, and nervous system support. Get maximum absorption with Nature’s Wonderland premium complex! 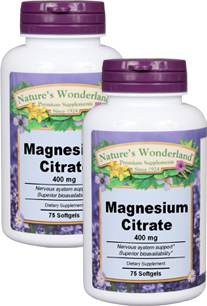 It combines three superior forms of Magnesium for superior bioavailability. Get dependable results with our premium Magnesium! Take 3 softgels daily, preferably in divided doses, with food. SEE PDF LABEL FOR CAUTIONS.